Stamping Stuff: FCD presents die-normous fun! Welcome to the FireCracker Designs by Pamela February Blog Hop! If you came here from Happy Hour over at Marie's - WELCOME!!!!! Most of the time there is a little goodie after a hop so you really want to start at the beginning and follow through to the end so you don't miss out! So what do you do with something like this? Well silly it is called a die cut and you stamp on it! THE WORK IS ALREADY DONE FOR YOU WITH THESE DIE CUTS! Yeah I am one who has some hand difficulties and cutting can be quite a challenge at times so this is so awesome that Pamela offers die cuts for many of her sets which allows me to layer things up and not have to cause myself undue pain in the process! Here is what I ended up with! A fun little card and I can add whatever message I want to the inside although I am thinking of a birthday greeting for a little boy and adding that I hope he shines all day on his special day! JUST in case there is a problem…here’s ALL the links…..
Oh WOW Karyn!!! This is so stunning!! Really LOVE your texture BG and the colors of you fish!! SO CUTE!!! Gorgeous!! I love the lead in, too!! Wonderful, Karyn! Love the fish and you made it look so good. So clever, love the card. Awwww, how charming!! I adore how it all came together; the colors are so happy, and the BG texture is just perfect! Fabulous, Karyn!! great job Karyn!! love the explanations and details you gave too! LOVE that bg texture, just perfect for this card, and really dig the way you layered it all together, and you showed how well this works for a boy card!! Just don't see enough of that!! grin...good stuff! WOW! This is good. Why hasn't anyone thought of this before???? But I'm sure glad Pamela did!!! This is super! Love the colorful fish. Great job! Here I am Karyn! I love your fishies and what a wonderful card for a boy. There's alot of possibilities here. Cute card! All those layers and textures look fabulous! OOo! I want this set too! I love your ink choice. Great job putting it together! Too cute~! Love what you did with the fish. Sweet card. Your fish are great. What a nice job you did. Ooh I love it Karyn! 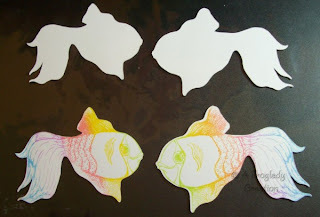 The fish looks wonderful stamped in multicolor ink like that!!! Cute card and love how you did the fish. Lovin all this eye candy. Karyn, I just love your card and the way you gave us a short tutorial! So pretty! Thank you! Hugs Lori R.
Really cute card! How nice not to have to cut these out. Thanks for sharing. Thanks for sharing. The goldfish are darling. Good job. 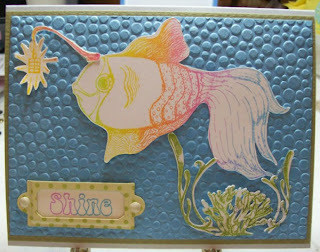 How cute...love the way you stamped the fish and used the cuttlebug background!! Super cute! I own this stamp set and love it! Great idea for a card. Very cute and your coloring is awesome. LOVE this set and the fact that they're cut and ready to go is so brilliant!! Great card Karyn!